A brief review of the Way of the Blade (sword work) course below. Following a very early morning start (there’s a 5 in the morning too?) a few members of the Portsmouth Dojo of the BBD piled into cars and travelled up to Newark for the Way of the Blade course, taught by Brian McCarthy. As the token white belt from the dojo I was a little nervous about what I was letting myself into, however thoroughly looking forward to a solid day of training ahead. Fast forward 4 hours driving and we arrived at the Newark Dojo. Before the training started, most people spent a bit of time getting to know the other members of the BBD – with an organisation as spread as ours, it’s fantastic to be able to get together, renew old friendships and share new stories. Then the fun began. After a longer than expected work out from one of the Irish black belts, we were all ready to begin some solid learning and refine our techniques. The focus for the course was The Way of the Blade, rather than focusing entirely on technique, we focused on using the blade as a tool, and strategies to use them effectively, rather than focusing entirely on new technique. Brian is a fantastic teacher, blending humour with knowledge and skill in a way that kept everyone interested throughout the day, no matter how tired or aching we were and passing over masses of knowledge at the same time. 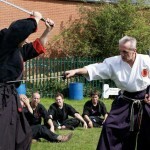 The course itself was extremely interesting, covering techniques with Shuriken, Tanto, Katana, Kama and Kusari, we never focused too long on the one thing and were kept constantly on our toes. I learnt loads throughout the day, started some hopefully long lasting friendships, I can’t wait for the next course!